Nancy Horan, the bestselling author of Loving Frank, comes now with her long-awaited second novel, based on the nineteenth century love story between Fanny van de Grift Osbourne, a not-exactly-divorced American mother of three and the much younger writer Robert Louis Stevenson. The pair met in the summer of 1875 in Grez, an art colony in France in the Fountainebleu Forest. Fanny had arrived in France the year before to escape her unhappy marriage and to study art alongside her 17 year-old daughter Belle. After enduring an unspeakable tragedy in Paris, Fanny decides to bring her children to Grez for some quiet recovery time in the country. A fellow art student at the Académie Julian suggested a quiet place, “an inn at Grez, on the Loing River. 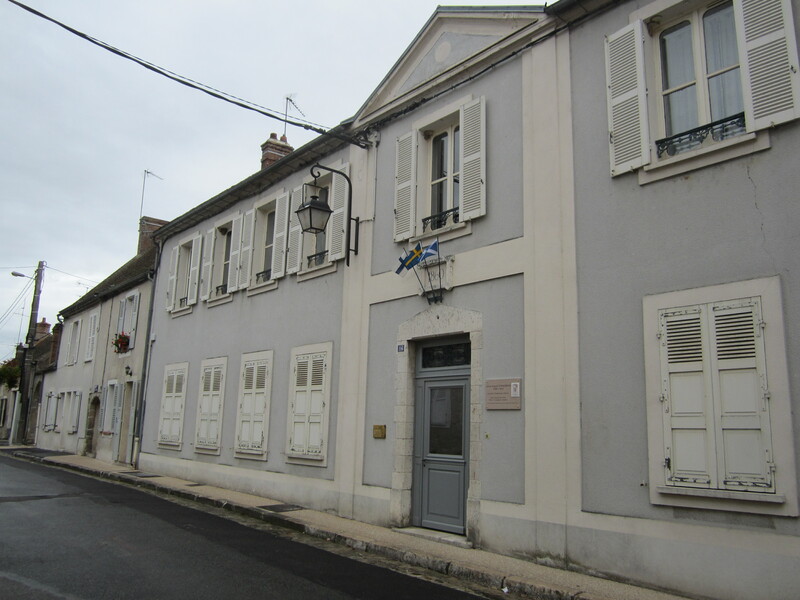 It’s close to Barbizon but away from all the bustle, and cheap. It’s near the Fountainebleu Forest.” Fanny talks her estranged husband from California into supporting them for one more year in Europe. 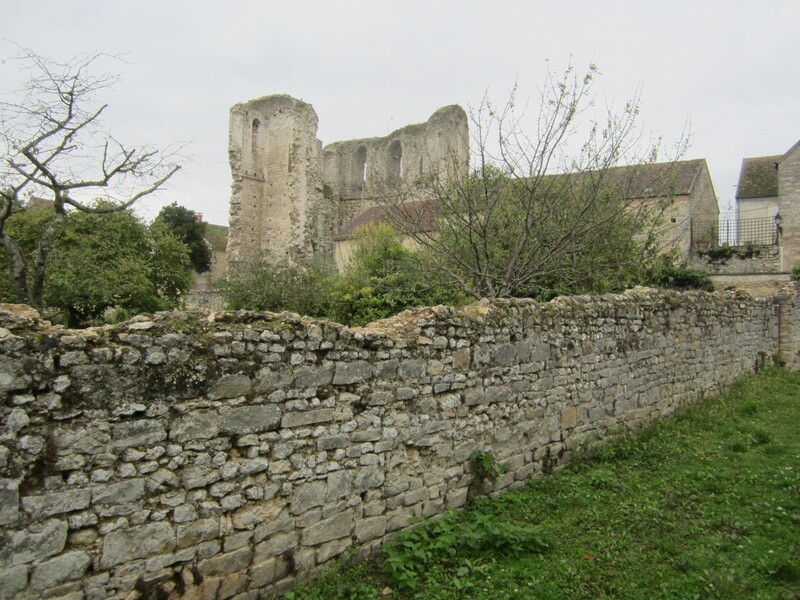 [N]estled in the midst of vast farm fields, the village was a smattering of stone houses, a picturesque bridge, and a ruined twelfth-century tower with ferns growing in its cracked walls. During my year in France I loved to plan field trips to art history sites, and I just happened to spend a gray day in Grez myself. 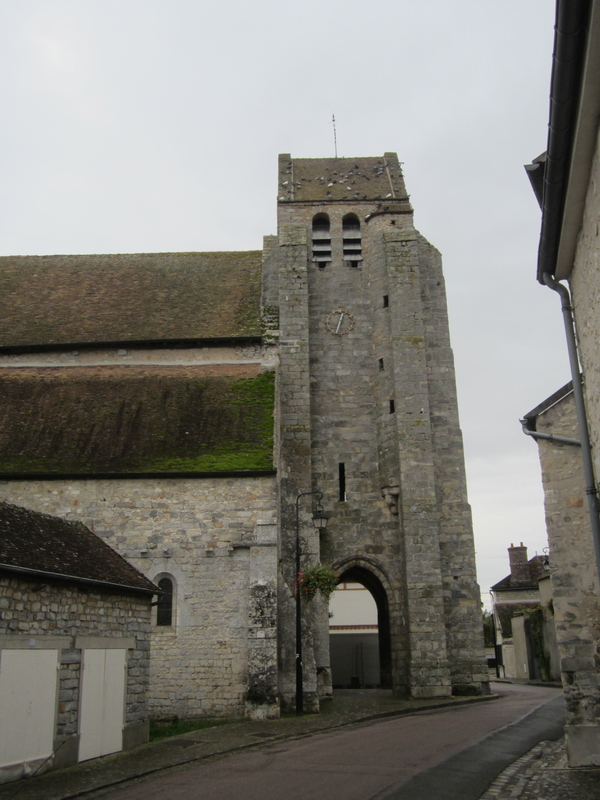 You can read another post (Visit an Art Colony in France: Grez-sur-Loing) about my trip to Grez, which includes directions and more information about the different artists who lived and painted there. 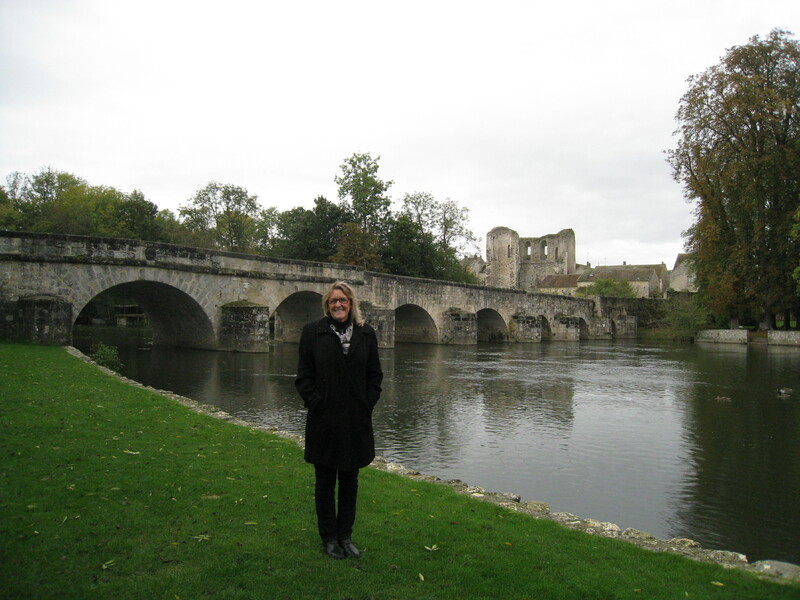 Standing in front of the bridge at Grez-sur-Loing in 2012. 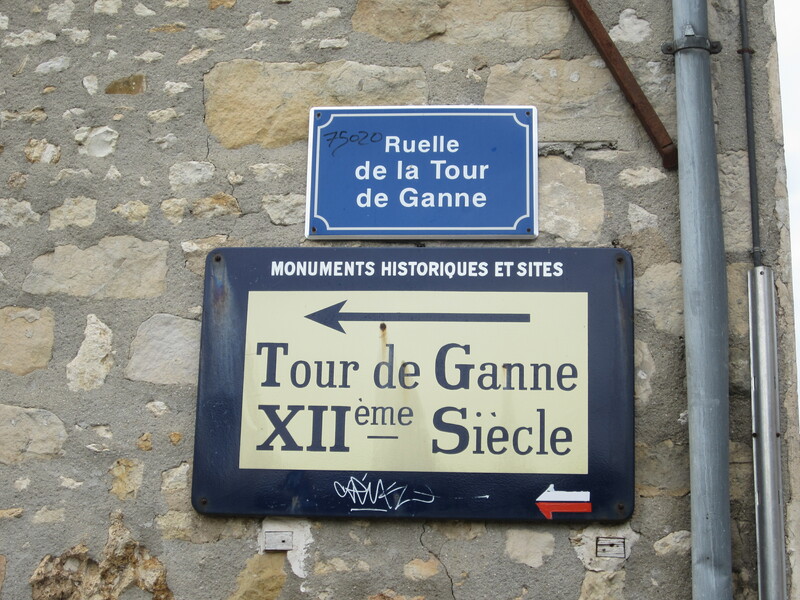 The picturesque 12th century Tour de Ganne is in the background. Barbizon has become too fashionable. It’s overrun by poseurs more interested in the mis-en-scene than in producing any actual art. The real painters go to Grez. . . . And you needn’t worry. They will leave you alone, I think. There’s an onslaught about to begin. . . . Once the others start to arrive you’ll discover this isn’t the place to be if you are hoping for a little peace. Madame Chevillon said you had come for the quiet. . . . There are places not far from here that would serve you much better if you are here to rest. . . . But things would turn out much differently than the Stevensons had planned. Within a few short weeks, both of the Stevenson cousins would have a crush on Fanny. Although Fanny was 10 years older than Louis, they found comfort in each others hearts and minds. In the meantime, Fanny’s 17 year-old daughter Belle fell in love with the Irish artist Frank O’Meara. 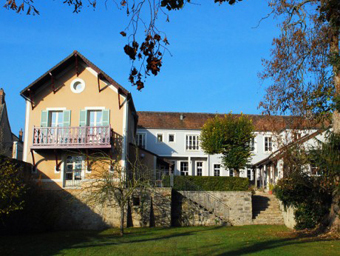 Hotel Chevillon, the place where Fanny and Louis met, is still standing! 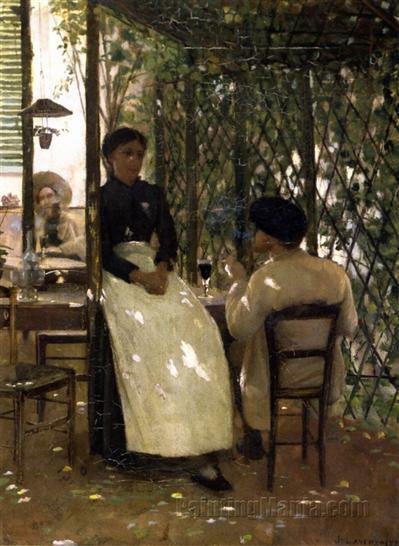 It is located on rue Carl Larsson, which is named after the Swedish painter. It was restored in 1994 and serves as an art center and residency program. 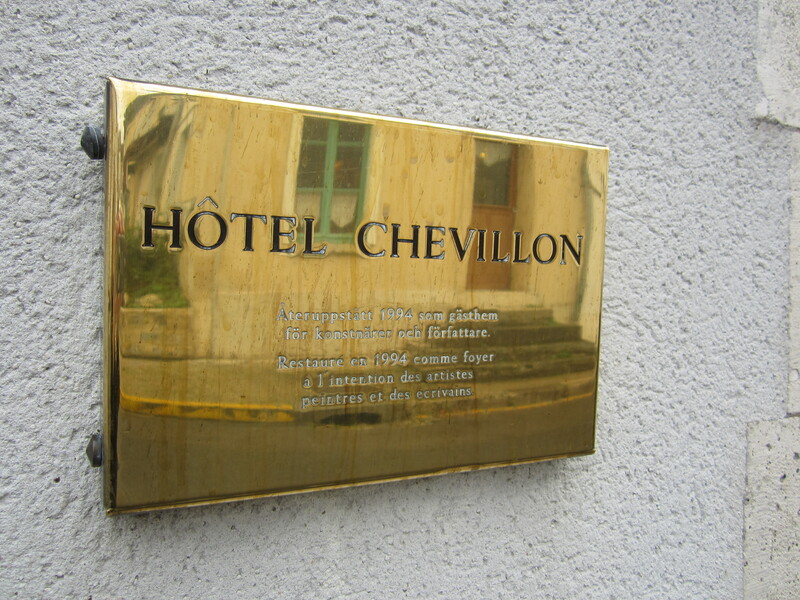 Hotel Chevillon from the street. A view of the back balcony of Hotel Chevillon from the nearby bridge. 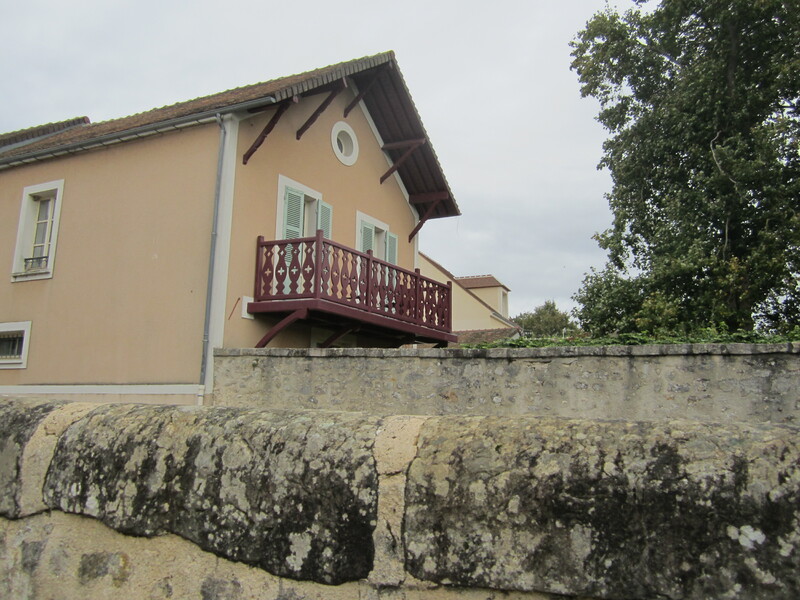 Just on the other side of this wall is where Fanny, Louis and their fellow bohemians gathered to paint and relax. After their summer meeting in Grez, Fanny and her children returned to Paris, where they settled into an apartment in Montmartre. Louis would continue his pursuit of Fanny from Paris to California and beyond. They would finally marry in 1880 and spend their years traveling the world. 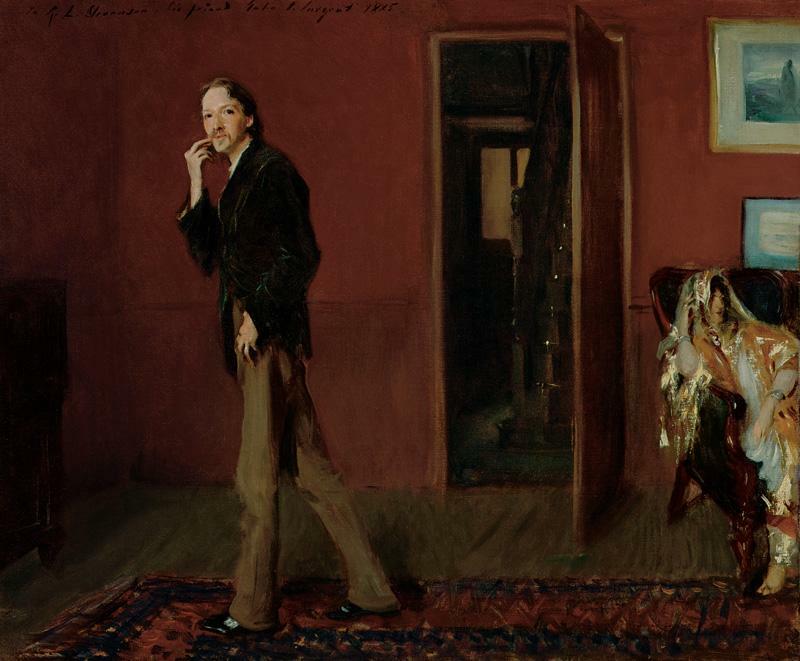 John Singer Sargent would paint a strange but perceptive portrait of RLS and Fanny when they were all living in Bournemouth, England in 1885. Apparently, Fanny was not too happy about the way she is marginalized and made to look so Moorish in this painting. As for me, I find it fascinating. What an odd pair. Under The Wide and Starry Sky is an interesting portrait of an unorthodox and artistic couple from history, not unlike the story of Frank Lloyd Wright and Mamah Cheney. However, this love story didn’t seem nearly as compelling as Loving Frank, and I’m not sure why. Neither RLS nor Fanny are particularly admirable people, but then, neither were Frank and Mamah. For some reason, it bothered me that Fanny lacked any substantial talent or drive as an artist, that she acted so passively in the face of her son’s serious illness, and that she waffled over her commitment to a horrible marriage. Maybe it’s my mistake, expecting a 19th century woman to act with as much agency as a 21st century woman, but still, it interfered with my ability to identify and sympathize with Fanny. I have to admit, I take strange delight in the take-down Fanny suffers under the paintbrush of John Singer Sargent. Even if Under the Wide and Starry Sky doesn’t measure up to Loving Frank, I would still recommend this book to fans of historical fiction, especially if you are interested in learning more about the writings of Robert Louis Stevenson or the 19th century art scene in Paris. And if you happen to be visiting Paris anytime soon, I highly recommend a day trip out to Grez. This entry was posted in Art History, Art History France, Art History Site, Book Review, Literary History, Literary Site, Paris Books and tagged Art colonies in France, Day trips from Paris, Fanny van de Grift Osbourne, Grez-sur-Loing, Hotel Chevillon, Loving Frank, Nancy Horan, Robert Louis Stevenson, Under the Wide and Starry Sky by americangirlsartclubinparis. Bookmark the permalink. “Loving Frank” was such an interesting and haunting book. I’ve never gotten over reading it and continue to remember the excellent writer Horan is. I cannot wait to read her new book. Thank you for bringing it to my attention.